Q: It is reported that a Chinese couple who teach the Chinese language were kidnapped in Quetta, the capital city of Baluchistan province in Pakistan on 24 May. Can you brief us on the latest development and what has been done by the Chinese side? A: On the afternoon of 24 May local time, two Chinese citizens were kidnapped by militants in the Pakistani province of Baluchistan. 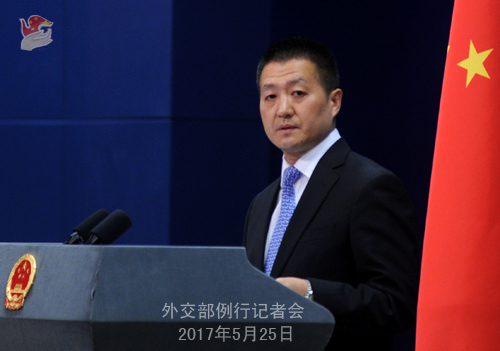 The Chinese government attaches great importance to the safety of overseas Chinese citizens and condemns the abduction of personnel in any form. After the incident happened, the Chinese government, along with relevant departments, the Chinese Embassy in Pakistan and the Chinese Consulate General in Karachi, immediately launched the emergency response mechanism. We keep close communication with Pakistan, request relevant Pakistani authorities to take every necessary measure to rescue the abducted while ensuring their safety, and take more effective measures to secure the safety of Chinese citizens and organs in Pakistan. The Chinese government will work with the Pakistani side to make the utmost efforts for the early and safe release of the kidnapped personnel. Q: According to US media, a US Navy warship carried out a so-called "freedom of navigation operation" within 12 nautical miles of the Mischief Reef in the Nansha Islands on 24 May. Does the foreign ministry have any comments on this? A: On the morning of 25 May, the USS Dewey missile destroyer entered the adjacent waters of the relevant islands and reefs in China's Nansha Islands without the permission of the Chinese government. The Chinese navy legally identified and verified the US vessel and warned it to leave. The relevant action of the US vessel undermined China's sovereignty and security interests and is highly likely to cause untoward incidents in the waters and airspace. China is strongly dissatisfied and firmly opposed to this. China has indisputable sovereignty over the Nansha Islands and their adjacent waters. The Chinese side respects and safeguards the freedom of navigation and over-flight in the South China Sea to which all countries are entitled under international law, but firmly opposes the undermining of China's sovereignty and security interests by any country in the name of the freedom of navigation and over-flight. With the concerted efforts of China and ASEAN countries, the situation in the South China Sea has gradually cooled down and is taking a positive trend. The above-mentioned action of the US has severely disrupted the relevant dialogue and negotiation process, which serves no one's interests. 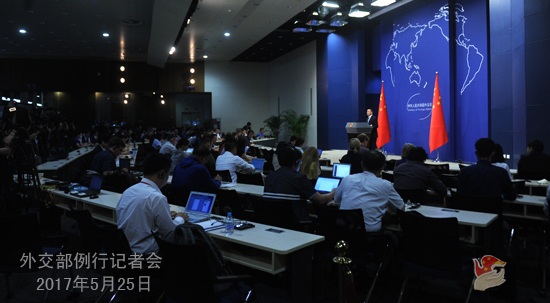 China has a firm resolve to safeguard its territorial sovereignty, security, and maritime interests and rights. We strongly urge the US side to correct its wrongdoing and stop any provocative actions detrimental to China's sovereignty and security interests so as to avoid any further damage to China-US cooperation and regional peace and stability. Q: According to the information on the website of the foreign minstry, when holding talks with Foreign Minister Wang Yi on May 24, German Vice Chancellor and Foreign Minister Sigmar Gabriel said obligations under Article 15 of the Protocol on China's Accession to the WTO should be fulfilled, and the revision of relevant EU laws should not discriminate against any country and must accord with WTO regulations. What is China's comment? A: This shows the responsible attitude of the German government and the Chinese government appreciates it. China has always closely followed the implementation of Article 15 of the Protocol on China's Accession to the WTO. The article is a "sunset clause", according to which the WTO members should have stopped using the surrogate country approach to conduct anti-dumping investigations on China by 11 December 2016. With the rise of protectionism, the attitude towards multilateral trade rules taken by major world economies will fundamentally bears on their own interests at the end. By an early implementation of the article, the EU will not only present itself as someone that honors its commitments and abides by rules, but also send a positive message of the EU joining China in upholding the open and free multilateral trading system. 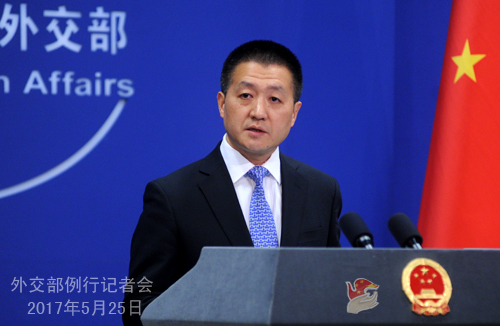 China hopes the EU can fully fulfill the obligations under Article 15 in its entirety as soon as possible and wishes to see Germany continuously exert its influence. Q: A UN report said that the China-Pakistan Economic Corridor (CPEC) could add more tension between India and Pakistan and fuel more political instability in the region. How do you respond to that? A: We saw some relevant reports by Indian media in this regard, but we need to get more information about the report you mentioned, but I can respond to you in principle. The Economic and Social Commission for Asia and the Pacific (ESCAP) is an important partner for the cooperation under the Belt and Road Initiative. The 73rd Session of ESCAP was held in Bangkok, Thailand days ago. During the meeting, participating parties appraised the important significance of the Belt and Road Initiative in promoting development in Asia and the Pacific, supported the synergy between ESCAP and the Belt and Road Initiative, and decided to promote connectivity through extensive consultation, joint contribution and shared benefits and carry out cooperation in such areas as policy coordination, infrastructure, investment, finance and people-to-people exchanges. This has again demonstrated and spoken to the extensive support for the Belt and Road Initiative from the international community. Recently, the Secretariat of ESCAP released a report on the role of the Belt and Road Initiative and ESCAP, which commends the positive significance of the Belt and Road Initiative in advancing connectivity and sustainable development in Asia and the Pacific and offers views and advice on ESCAP's participation in the building of the Belt and Road Initiative. According to our information, ESCAP did not issue a specialized report on CPEC. As to your question that CPEC may involve the disputed areas between India and Pakistan, we have reiterated many times that as an economic initiative, CPEC is neither targeted at any third party nor related to territorial disputes. It will not affect China's principled position on the Kashmir issue. Q: US President Trump boasted to Philippine President Duterte in the telephone conversation that the US has two nuclear submarines off the coast of the Korean Peninsula. What does this say to China about the US' intentions with regard to the DPRK? A: I am not in the position to comment on the information from media before the relevant country clarifies the situation officially. As for the issue related to the security and stability of Northeast Asia you just mentioned, I believe you must be clear about China's stance. We have always maintained that the situation on the Korean Peninsula is highly complex and sensitive and upholding peace and stability on the peninsula serves the interests of all parties concerned, and the relevant parties should play a constructive role to this end. Q: It is reported that State Councilor Yang Jiechi is visiting Japan next month, which will make preparatory work for the meetings between Chinese and Japanese leaders on the sidelines of the G20 Summit in Germany and the China-Japan-ROK leaders' meeting in Japan. Please brief us on that. A: I do not know where you heard about this. But we will release in a timely manner the information on the visit of Chinese leaders, including the high-level exchange between China and Japan, once they are determined. On your question about whether the Chinese and Japanese leaders will hold meetings on the sidelines of the G20 Summit and whether the China-Japan-ROK leaders' meeting will be held, I do not have any information to offer. But I have stressed repeatedly from this podium that maintaining high-level exchange is beneficial to the China-Japan as well as China-Japan-ROK cooperative relations. At the same time, relevant parties should make efforts to create necessary and appropriate conditions for this purpose.